Claim: solar cells that produce two electrons for every photon, resulting in over 100% quantum efficiency | Watts Up With That? From the I’ll believe it when I see it department comes this claim. Throughout decades of research on solar cells, one formula has been considered an absolute limit to the efficiency of such devices in converting sunlight into electricity: Called the Shockley-Queisser efficiency limit, it posits that the ultimate conversion efficiency can never exceed 34% for a single optimized semiconductor junction. Now, researchers at Massachusetts Institute of Technology (MIT) have shown that there is a way to blow past that limit as easily as today’s jet fighters zoom through the sound barrier—which was also once seen as an ultimate limit. Singlet exciton fission transforms a molecular singlet excited state into two triplet states, each with half the energy of the original singlet. In solar cells, it could potentially double the photocurrent from high-energy photons. We demonstrate organic solar cells that exploit singlet exciton fission in pentacene to generate more than one electron per incident photon in a portion of the visible spectrum. Using a fullerene acceptor, a poly(3-hexylthiophene) exciton confinement layer, and a conventional optical trapping scheme, we show a peak external quantum efficiency of (109 ± 1)% at wavelength λ = 670 nanometers for a 15-nanometer-thick pentacene film. The corresponding internal quantum efficiency is (160 ± 10)%. Analysis of the magnetic field effect on photocurrent suggests that the triplet yield approaches 200% for pentacene films thicker than 5 nanometers. Figure 1 Singlet fission dynamics in pentacene. Calculations of singlet and triplet excitons and charge transfer states at the pentacene/fullerene interface are shown, with the purple (orange) density indicating where less (more) electron density is found in the excited state. The delocalized singlet exciton and two localized triplet excitons are circled in red. The loss pathway for singlet excitons is direct dissociation into charge before singlet exciton fission. Fig. 2 Device architecture and EQE of a pentacene solar cell. (A) Chemical structures and architecture of the solar cell with the thickness of each layer in nanometers and energy levels of the lowest unoccupied and highest occupied molecular orbitals in electron volts (12, 18, 20, 29–31). The anode is composed of indium tin oxide (ITO) and poly(3,4-ethylenedioxythiophene) poly(styrenesulfonate) (PEDOT:PSS). The cathode employs bathocuproine (BCP) and a silver cap. (B) External quantum efficiency of devices without optical trapping (blue line), and device measured with light incident at 10° from normal with an external mirror reflecting the residual pump light (red line). Optical fits from IQE modeling are shown with dashed lines: modeled pentacene EQE (blue dashes), modeled P3HT EQE (purple dashes), and modeled device EQE (black dashes) for comparison to the measured device efficiency without optical trapping. The headline makes no sense. That’s not the claim the paper is making. The paper is claiming that energy that otherwise would have gone into heat, is instead put into moving two electrons instead of one. If it work exactly as claimed, then the efficiency would still be well below 100%. Use the first 100% of to power a light above the cell to generate yet more electricity and use the rest for something else. Once you have it started, you’ve got an endless supply of free energy. .
What could possibly be wrong with that idea. Judging by the context,what they mean by “quantum efficiency” isn’t the ratio of electric energy out to photon energy in but the ratio of electrons out to photons in. There is always hype in research and as you say we will just have to wait and see. Just in case there is some confusion, I will point out that quantum efficiency is a much different thing then thermodynamic efficiency. This is made clear in the linked article where it is also stated that the thermodynamic (overall) efficiency is only 2% in the device at present. Quantum efficiencies greater than one (100%) are not unusual. What the authors claim is new is the extension of this from the ultraviolet into the visible. They may, of course, be underestimating the problems yet to be surmounted, but such is the game of research. “Singlet exciton fission transforms a molecular singlet excited state into two triplet states, each with half the energy of the original singlet”…. Not sure of the physics in this, but it sounds like all they’re saying is that this process yields more electrons at the same (or closer to the) total energy of the photon, whereas the previous process only could yield a single electron at a certain energy level, with excess energy from the photon being lost as heat. The above sounds like there’s no claim of violation of the 2nd law (e.g. more energy out than in). Also, doesn’t a high energy gamma (nothing more than a very energetic photon) produce thousands of free / knocked loose electrons as part of the ionization process? Each one takes some of the energy from the gamma…..no violation of 2nd law there even though it frees up thousands of electrons per photon. Of course, I do agree with the sentiment of show me. And detail how you did it so it can be independently replicated (e.g. real science), don’t pull the whole “peer review” pseudo-science. OK we’re talking about converting Radiant Energy (Photons) to Electrical Energy (Electrons). So how many Photons = 1 Electron, or is it as I suspect more complicated than that? Sorry, but your headline is completely misleading. 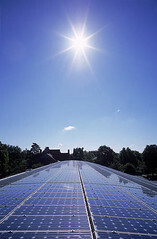 100% efficiency for a solar cell would mean that all of the incoming solar radiation is converted to electricity. That is not what the article claims. The science may or may not be legitimate, but your headline is 100% wrong. You beat me – and I suspect several others – to it. The writers talk of taking PV panel efficiency from 25% to 30%, not a bad improvement. I do not know where the 100% cam from. This reopens a ‘discussion’ into Einstein’s view on light propagation and photons. Also the differences between emitted and absorbed photons. Is what this is really doing is [potentially] boosting the Shockley-Queisser efficiency limit to 68% at certain wavelengths? This effect would be wavelength dependent? Am I understanding correctly that 670nm seems to be a critical wavelength and less energetic photons won’t have enough energy to eject two photons? Thus what would the real efficiency gain be assuming normal sunlight? Of course if you are also reducing thermal gain to the cell you might reduce loss of efficiency to increasing cell temperature as well. It will be interesting to see what comes of this. Potentially a game changer. OK, I see that your headline has been updated. Disregard my previous comment. I keep seeing confusion about the First and Second Laws of Thermodynamics…. Converting local heat into electricity is a Second Law violation. It does not imply a First Law violation. It doesn’t mean you can use a unit to power itself and produce even more energy. That would be a First Law violation, and something completely different. At most, this line leads to a situation where the conversion of phonons into electron/hole pairs is statistically more probable than the reverse. That isn’t anything like trying to convert previously non-existent energy into electron/hole pairs. If the cell was 100% efficient you would not be able to see it since all the light striking it would be converted to electricity. Longevity may be an issue here, pentacene is sensitive to moisture and oxygen at the molecular level, The resulting solar panel will have to be perfectly sealed. The solar panels on my roof are reckoned to last about twenty five years before the output starts to drop off significantly. Just guessing, but if each photon starts knocking off twice as many electrons, doesn’t that imply that the panels will last half as long? No, the electrons are circulated through the materlal and the external circuit. You don’t “run out of” electrons. If the cells were 100% efficient you wouldn’t be able to see them since all the light striking them would be converted to electricity. I recall. Whether the greater efficiency is valuable depends on the added cost to achieve same. Reminds me of the math used to calculate GDP in Q1 2013. Yea I would be careful about this one. It looks like the quantum efficiency is increased not so much by this effect but by the mirroring of the light. Also, there is a huge gap between what looks good in the lab and what works in the manufacturing environment. In the typical photovoltaic cell, a cubic crystalline Silicon base, with four outer shell electrons, is irradiated with Boron having five and Phosphorus having three outer shell electrons. Sunlight ‘excites’ the one, least stable, outer shell electron, which ‘flows’ thru the Phosphorus electron ‘hole’, exiting the cell as one-way, direct current. This is molecular erosion that never returns the mining, refining, manufacturing, transporting, installing and in less than 20 years, disposing of this solar Ouija board parlor trick. Forcing an extra electron out of one of these three grid materials would make only a marginal difference in this electron erosion process. More on this in, “The Green Prince of Darkness”…. One Wonders Where the World Would Be….Without these Wicked Weather Wiccans…. or the banking Ponzi scheme that has finally gotten so bad, even the greennies have noticed…. It still doesn’t address the problem of what to do when the sun goes down. What we need in panels that work off starlight. Until then, I’m planning on setting up a humongous flywheel in my basement. A thousand tons sounds right. During daylight energy would go into getting it spinning, and then you could draw energy from it at night. This reflects the challenge of apples/oranges comparison differences in “efficiency”. Sunlight to delivered AC electricity etc. The three-layered cell, SJ3, converted 43.5% of the energy in sunlight into electrical energy — a rate that has stimulated demand for the cell to be used in concentrator photovoltaic (CPV) arrays for utility-scale energy production. Last month, that record of 43.5% efficiency at 415 suns was eclipsed with a 44% efficiency at 947 suns. Both records were verified by NREL. The greater potential is to develop a commercial rectenna capable of directly receiving solar energy and converting it to DC electricity. We developed the calculations based on the theory of PAT and showed that, for diodes that are optimally matched to antennas, monochromatic power conversion efficiencies approach 100% and the multispectral efficiency is limited to 44% at solar terrestrial intensities. Spectral splitting can improve the efficiency, and can be accomplished simply by setting the operating voltage for each rectenna to rectify the desired spectral range. For years, scientists have studied the potential benefits of a new branch of solar energy technology that relies on incredibly small nanosized antenna arrays that are theoretically capable of harvesting more than 70 percent of the sun’s electromagnetic radiation and simultaneously converting it into usable electric power. e.g. see Solar rectenna images. PS Q. Daniels – cf “local heat into electricity is a Second Law violation”. Please rephrase/clarify. Every engine-generator or turbine-generator converts local heat into electricity while obeying the 2nd Law – i.e., with less than the Carnot efficiency. Given the huge number of exaggerated, false claims coming out of the Universities and the renewable energy business, I share the skepticism of each claim until the process has been demonstrated to be commercially viable and fully vetted by competent engineers and scientists. This is based on experience over many years since I have supported, via Engineering, numerous R&D projects that have not been commercially viable for a variety of reasons. Given the above, I support fundamental research projects to find more efficient or new energy sources, but despise the rush to build commercial plants even demonstration plants with tax payer dollars before the proper research is completed. The DOE are incompetent to decide where to spread tax dollars around and actually hurt development by pushing losers. Recently I have seen, from the inside, biofuel projects that have utterly failed because the work process is totally broken, and the shortcut is to get government funding for expensive demonstration scale plants before the technology is ready from the bench scale research/development. While I am skeptical, I am hopeful that someday there will be a breakthrough. If this is real and can be commercially applied, think how stupid our governments have been to force commercialization of useless solar facilities that were not actually commercially ready for implementation; and now we have numerous white elephants on the ground at huge taxpayer expense while connected friends of the government have enriched themselves by selling extravagantly priced electricity which forces rate payers into near poverty and kills industry. . Yes, it’s true. That would be an awesome stealth tech. But I fear that you would have to approach zero Kelvin to achieve that. The pilot would need big mittens to fly the jet. If the energy of an incoming photon generates carrier pairs with more energy (pair-count times bandgap) than the photon, the extra energy would come from local thermal energy. In effect, the carrier pair energy would be “topped up” by local thermal energy. That would be a local violation of the Second Law, which in itself is not very interesting. At that scale, they happen constantly. If the average extracted energy exceeded the energy of all incoming photons for an entire device, the device as a whole would be converting its internal thermal energy into externally available power. It would get cold when exposed to light. That would violate the Second Law. It would not, however, violate Conservation of Energy (the First Law). Of course, there is no fundamental barrier to fusion energy, either. It’s always the perennial 50 years in the future. Next question: how much does pentacene cost? I don’t see any particular problem with efficiency over 100% as long as 100% efficiency is defined as ratio of number of incoming photons and number of electrons transferred over cell’s energy barrier. Crossing that barrier requires certain energy but incoming photons may carry more than that energy. If they managed to transfer two electrons before the excess energy is dissipated as heat, no physical principles got violated. – The process removes electrons from the material. – Those electrons are not replaced. – In less than 20 years, the material is so depleted of electrons (“molecular erosion“) that it has to be replaced. – The energy cost (“mining, refining” etc) of making and installing the material is greater than the energy generated during its lifetime. – Knocking out 2 electrons at a time instead of 1 doesn’t change the basic equation. Is there anywhere we can verify what you say, eg. by accessing figures for total energy costs and output? If the average extracted energy exceeded the energy of all incoming photons for an entire device, the device as a whole would be converting its internal thermal energy into externally available power. It would get cold when exposed to light. That would violate the Second Law. I could certainly be wrong here, but in a different context, is it not possible for infrared light to shine on the surface of the water in such a way that the energy is just a bit less than the energy required to evaporate a water molecule? However due to the Boltzmann distribution, is it not possible for a more energetic water molecule to be struck and have it evaporate thereby lowering the temperature of the remaining water without violating any laws? Pentacene is a good material for making sensitive X ,Y array photon detectors when combined with PbS, P and N nanoparticles, however, it degrades at the high power levels needed for power generation. Photons come in various frequencies which we interpret, in the visual range, as colors. The different frequencies correspond to different energies E = hv where h is a constant and v is the frequency. The energy you get from an electron depends on the voltage you move it across. That is, the unit of energy is electron-volt. So what’s going on here is that they’re getting two electrons to move over a lower voltage while previously technology had one electron moving over a higher voltage. Whether this is better or worse than before depends on the ratio of the voltages. But generally, this is a well known result in the solid state physics community. It’s outside my area but I vaguely remember going to a talk that mentioned the subject this past semester. It’s really no big deal, just steady attempts at improving efficiency of solar cells. The journalists end up mangling some of the message. Still on “greater than 100%” : I can theoretically get a greater than 100% return on the electricity that runs my heat pump. But that is because some of the delivered energy comes from underground (which is left cooler) not directly from the electricity input. In the case of the photovoltaic material, I suppose it would be theoretically possible to get above “100% efficiency” if the material cooled. Doesn’t sound even remotely possible in practice, though. Pentacene is only one of the important ingredients. There are other ingredients and the matter of the entire electron transport structure. Sensors made with these technologies come close to what night vision goggles can do. Imagine your smart phone enabling you to see at very low light levels. The problem is however is that your face is lit up by the phone screen. Thin flexible solar cells are a proven technology, companies like United Solar Ovonic were making sheets that could cover a football field which were cut into individual products, like their popular peel & stick “roofing” rolls. December 2012, Stanford announced flexible cells that could be stickers. January 2013, Swiss researchers announced a record-breaking 20.4% energy conversion efficiency, with a flexible cell on a polymer film substrate. Basically, they can print cells. It’s proven, they do it regularly. So what will be an upcoming major solar panel development, that might actually be worth something? The dimple panel. Why print only flat? Have a “dimpled” surface, with a pattern of recesses, squares would be good, perhaps 2 to 3 inches on a side. That increases the surface area of cells without increasing the panel footprint, with increased output. With encapsulated panels, the cells are coated rather than protected with a flat sheet of glass, the horrible ugly glare from solar panels is practically non-existent. This would be far easier than you may think, as the “print head” would have to move in another direction (towards & away from the surface) at high speed, but synchronized 3-axis motion is relatively ancient technology in machining and other manufacturing. Thus there shall be thin dimple panels, with some competition between different makers as to superiority of their own pattern, between “dimples” and “bumps”, etc. Cheap, basically we already have the technology. They will also have some built-in flexibility, you can screw them down directly onto an uneven or somewhat-curved surface, and not be as concerned with flatness as with current rigid panels. Heck, you won’t even need the usual panel mounting track system. Just spacers to keep them off the roofing, and long lag bolts, screw them right to the rafters. Increasing panel efficiency by material technology is very difficult, to do so in a commercially-viable manner is the Holy Grail of solar power research. Much money has been spent pursuing the goal, including much taxpayer money “for our own good”. But a quick increase in output of perhaps 50%, using existing technology, would be so cheap and easy to accomplish, manufacturers would be dead stupid to not try it. Wait for it, it will happen. After all is said and done in photon energy capture, it goes without saying, there is no free lunch. There are rare situations in PIN diodes, when the photon counts are high enough, that two photons arrive in coincidence and produce a sum peak, in other words the number of electron hole pairs are those that would have been produced by a photon of twice the energy of an identifiable energy peak of incoming photons. After all is said and done E=H nu. A lot of these materials can also act as photon emitters. Some losses in these materials are also due to electron recombination that lead to fluorescence. Squeezing 1% more efficiency out of PV devices should not be trivialized, it is just as important as squeezing 1% more out of an oil field, or a power plant. I sure hope it works but …. How much energy does it take to make pentacene? And is it used up during this process? So. It appears God, indeed, does not play dice with the universe. He plays billiards. Thanks for clarifying what you said on local energy and the 2nd Law. However, it is possible for selection of electrons can cause cooling. e.g. see Introducing the quantum refrigerator. Do first principles necessarily forbid cooling by photon conversion to electricity? That would be Photon Frequency Modulation. I think I’ve read about that. Really mean: We are well over the 34% limit? Even that would be amazing. Extra ordinary claims require extra ordinary proof. I’ll wait on this one for further validation and clarification of terms. Well played sir! And you know the sad thing is that there is probably an actual majority that believe in that exact scenario. They’re easy to spot because they are the ones scratching their heads trying to make a car run solely off the alternator 🙂 Needless to say they’re also the ones that gravitate to AGW and other pop-Science. Looking beyond just sunlight on solar cells, what if we had near 100% conversion of monochromatic photons to electrons coupled with a quantum refrigerator, might we be able to cool with photons? However, if we have a rectenna with a quantum refrigerator lit by polychromatic light with 70% conversion efficiency via a rectenna, then it wouldn’t that depend on whether the quantum refrigerator efficiency could accommodate the 30% solar to heat conversion? I don’t know if anyone has added, what they did was redefine the old efficiency limit as 100% and then noted they’ve made a new process with a greater efficiency of photon –> electron transition which, relative to the old theoretical limit, is “over 100%.” It’s a quirk expressing efficiency as a derivative percentage of a more traditional definition of efficiency. Just make sure that half the flywheels spin clockwise and half anti-clockwise, no problem then. Well the paper as described is a bit misleading, but not necessarily a falsehood. I didn’t read anything about the cell Voltage that you get with this process. A normal common garden variety silicon junction, puts out a cell Voltage of about 0.50 Volts, at maximum power loading. At lower loading (higher load tresistance), the cell Voltage increases up to the open circuit Voltage, which is in the 0.6 -0.9 Volt range, and depends on the material bandgap. At heavier loads, (lower resistance) the current increases up to the short circuit current, but the Voltage goes to zero. The short circuit current is proportional (roughly) to the cell irradiance (W/m^2), while the OC Voltage is proportional (roughly) to the log of the irradiance. For photon energies below the bandgap, the material is essentially transparent, so the radiation photon passes through the cell, and doesn’t get absorbed. photons above the bandgap energy, do get absorbed. That’s the PV effect Einstein got his Nobel for. The higher the photon energy above the bandgap, the shorter is the absorption length, so the electron is released closer to the surface. I has to make it across the junction to end up as external current, so at some point higher energy photon efficiency suffers from loss of the carriers. So-called “blue” cells, use thinner layers to ensure efficient capture of the electrons, but at a loss of lower energy photons that go right on through the thinner cell, without getting absorbed. As the paper points out, photon energy above the bandgap generally results in heat losses. You may get two electrons emitted, in these materials, but what is the cell Voltage at maximum power load. Incidently, photo-multiplier tubes, rely on multiple electron emission, not so much from input photon energy, but from electron multiplication due to the acceleration of the emtted electrons in between dynodes. Some materials used in PM tubes, notably the III-Vs GaAs, and GaP can emit a half dozen or more new photo-electrons. The problem of higher energy photons is the reason for multi junction multi bandgap solar cells. The blue bandgap layer is on top, and stops the highest energy photons. The red layer stops the next longer wavelength photons, which go right through the blue layer, and the bottom layer is GaAs or something similar, which can capture the near IR photons, that go through both the upper layers. Present record for a triple junction triple bandgap solar cell is about 43.5 % conversion from solar W/m^2 to DC power out. Dunno offhand what the optimum load cell Voltage is, but it is for three bandgaps in series. This new cell adresses the energy lost above the bandgap as heat. Incidently the 670 nm photons they mention are about 2.0 eV energywise So what do you get if you have 1.9 eV photons, or 1.8 e V photons, in the way of cell Voltage that is. Do you always get two electrons of the same energy, or one higher and one lower ? Not if using photon entanglement imaging, experiments has shown that “normal light” have statistically enough “entangled like” photon to generate usefull imaging. Also a perfect blackbody is not invisible by itself if the background is not black. Quantum efficiency is simply electrons per photon, in the case of solar cells, or verse vicea in the case of LEDs. Nothing more, nothing less. In the case of a solar cell, that would be electrons kicked from the valence band into the conduction band, for INTERNAL quantum efficiency. If the electron makes it across the junction, without getting reabsorbed, it will likely make it to the terminal, and contribute to the external circuit current. At that point the ratio of electrons to input photons is the EXTERNAL quantum efficiency. QE is not the same thing as conversion efficiency, which is electric otput power Volts x Amps versus radiant power in (Watts). Materials which make good LEDs, are also good solar cells. If light generated inside an LED gets trapped optically inside the chip, which is typically a high refractive ndex material, the photons will eventually be reabsorbed by the diode, and generate a current opposite the externally applied current. The best LED structures have very close to 100% internal quantum efficiency, and their overall efficiency is limited by optical (TIR) trapping. A new InGaN LED grown on a native GaN substrate, and sawn into equi-triangular die, developed by Sorah (Shuji Nakamura) has very high external QE as a result of high internal QE and efficient optical extraction. Shockley-Queisser efficiency limit, it posits that the ultimate conversion efficiency can never exceed 34% for a single optimized semiconductor junction. jet fighters zoom through the sound barrier—which was also once seen as an ultimate limit. But hang on, are you telling me there are sceptics out there who didn’t believe the science? Over 100% efficiency is impossible. 2nd law takes over. More than 100% effciency is the quantum efficiency: single photon frees more than one electron. Energy efficiency is still well below 100% – of course! Efficiency aside, you can’t get past the simple fact that the energy in a square meter of sunlight is pitifully diffuse compared to fossil/nuclear fuels. Maybe the next “breakthrough” will be solar-cell-lined windmill blades…. I did graduate research in the early 90’s in fullerenes. At the time, they were a chemical marvel and were going to “change the world”. After 5 years and untold money, we were not able to produce one useful, viable application for them. I am happy to see they may be commercially useful somewhere. More “energy produced” than energy “received”? As I read it, does not seem possible with current technology IMO. Increasing the efficiency of solar cells is all very well and good but, even if efficiency was 100% there are still major flaws with solar technology and the implementation of it. The future of solar cells should be concentrating on the “smart devices market” such as all these souped up web enabled smart phones and touch pad devices, the reason behind this is, more and more people will not be buying laptops, PC’s and Mac’s in the future as smart devices suit the majority of peoples needs, even laptops have only a short battery life which makes them less portable, if company’s concentrated on supplying a solar charger with every new smart device then this would remove these devices from the electrical grid. Instead of creating an expensive solar energy disaster, that solar companies pushing their product to take over an electrical grid with inferior technology from the top down would, they should evolve the way every other technology does, from the bottom up and begin to take advantage of vast markets suitable for the product they have. Many people writing comments are confused by what Quantum Efficiency means and do not understand how it can be above 100%. Well don’t keep us all in suspense. Just what is it the secomd law has to do with quantum efficiency. We are waiting on you to enlighten us. How about you consider this. Light photon triggers a response in any medium. The most efficient responder delivers or excites a measured result. Question; is silicon a generator of electrons? Is the silicon (heat) excited and therefore a generator of electrons. What material could generate or be excited more intensely per unit of light converted to heat? Or would it be better to use fiber optic (glass tubes) to switch triggers and generate an electricity field or electro magnetic response? Seems to me solar using sili_con is a bad joke played on action response mechanisms. >100% *quantum* efficiency is still only about 30% *energy* efficiency. All that is going on here is a novel mechanism that allows collecting more energy from the incoming photon. Note that this is wavelength dependent – photons with wavelengths too long (i.e. low energies) will not excite the singlet state at all. Photons with too much energy will only lead to more thermal energy in the matrix and the emitted electrons – energy efficiency drops off. Well massagrabber, I think you meant to post this on the Martha Stewart dishwasing blog. The mechanism cited in this paper has been known (of) for quite some time. The paper cites observation of it under specific conditions in a specific material (pentacene). It does not describe the conversion of the complete earth surface level solar spectrum energy to electricity; and it makes no assertions relating to energy conversion efficiency of any device, and does not involve any thermodynamic considerations. But it is a long way from a means to getting efficient solar energy conversion. As it happens, there is a solar energy; mostly PV symposium, tomorrow at UC Davis. If I can find anyone who is in on this pentacene two electron gig, and learn anything, I’ll post something. Well I said I would ask about the process described in this paper, at the UC Merced Solar Symposium, held at UC Davis today. The very first paper was a very informative about the history of solar cells in the USA. The first actual application of solar cells in the USA was actually a project most of you are too young to know about, let alone remember. In 1958, too late to get in on the big international geophysical year gig, project Vanguard, which had degenerated to project rearguard, finally succeeded in launching Vanguard 4 carrying a satellite about eight to ten inches in diameter. Vanguards one through three had gloriously blown up on launch destroying the satellites. #4 finally made it, a year after Sputnik. Built for the Navy, V-4 was battery powered, for reliability, but it had on its surface, about six solar cells about one inch square each. The builders wanted nothing to do with these unreliable solar cells (silicon), so they were separate, and could only be switched on, once the reliable battery power ran out. So V-4 beeped annoyingly for a few days, while the batteries lasted, on a 40 MHz frequency band. Then the solar cell crap, bult by Hoffman electronics; most of you have never heard of, at about $150 a piece, got turned on. V-4 then became a total nuisance, as those unreliable Hoffman solar cells powered V-4 for the next 7 years. Nobody built in an off switch, so that band was dead, until V-4 finally did the graveyard spiral thing. So this speaker actually had with him, the actual Vanguard 5 satellite, that never did get launched. He did admit that the six antenna rods were replacements, the originals having been damaged down through the years. I guess the Smithsonian don’t realize that this chap still has their gizmo. He incidently is with NREL, the National Renewable Energy Laboratory in Colorado. I asked him about the two electron process, which he is aware of, but he said it only works at specific photon energy input. So it simply doesn’t operate at all wavelengths with a solar spectrum input. So not a fraud, but not any panacea, and just one more process that dodges one bullet, only to run into all the rest. Maximum solar cell conversion efficiency is still 44%, about same as at last year’s symposium in Merced. Deliberately not dropping hisname, since I didn’t make written notes of our conversation. Symposium was very informative, and better than last year. But the general tone was set by all these folks swilling at the public trough, and complaining that their biggest problem was not price competition from communist red China, but price competition from a plentiful energy source known as natural gas; now called “frack” gas. So they are all promoters of CA prop 32, which outlaws fossil fuels. The science papers were very good however. Some very practical; some science interesting, but going nowhere. This chap also had a Solyndra solar tube, which was exactly the size of a four foot T-8 fluorescent tube. He said NREL had measured this contraption at 21% conversion efficiency; but not in a rooftop installation.